Has everyone dug themselves out after the polar vortex? We didn’t get hit as bad here in Spearfish as they did back in Central Illinois, but with the wind chill putting the temperature solidly in the negatives, walking the dog became more challenging than ever. Add to that an abundance of snow and ice, and she wasn’t eager to step foot outside. In just a few minutes, ice built up between her pads, making it painful to walk. Can you call a pup a winter dog when she doesn’t want to step outside the house? That might not seem like a big deal. “Just let her chill in the house!” people told me. Inkling is a lot of things, but chill isn’t one of them. 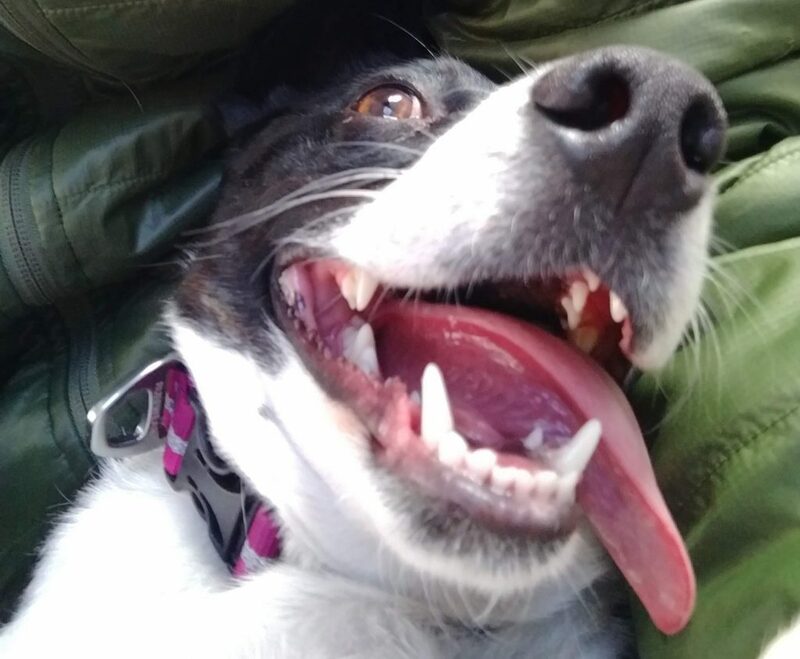 She has a lot of energy, and she simply doesn’t expend it as well inside the house. Even when we spend time actively playing and training inside, it isn’t the same. She doesn’t get the exercise that she does when we go for a run, take a long walk, or play ball in the back yard. In short, extreme cold has led to one cranky pup! 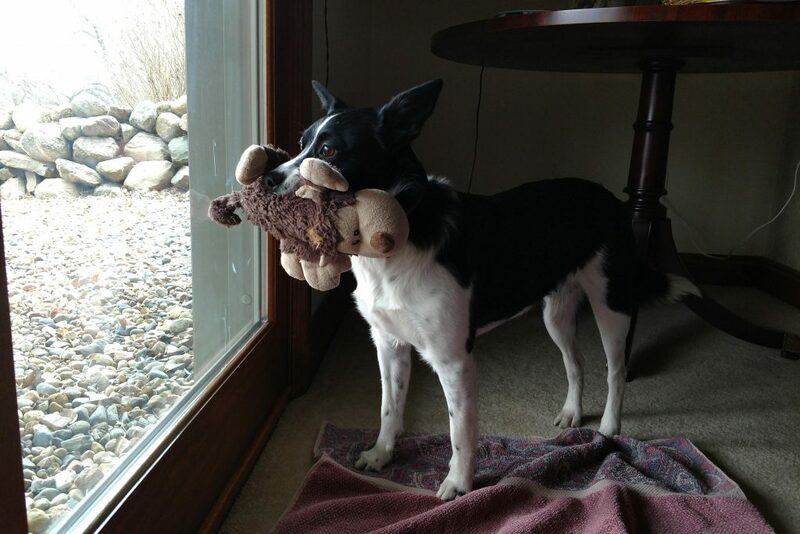 Much like her owners, Inkling quickly grows downtrodden when she can’t play outside. But instead of letting her stay a cranky pup, we decided instead to get her squared away as a winter dog! That meant extra layers and wool socks for us, and these two very important items for her. Most clothing for dogs centers on fashion; something that dogs simply don’t care about, but their owners enjoy. In many ways it’s harmless, although dogs can overheat in big sweaters while in a toasty warm house. We’re guilty of the occasional Halloween costume or Christmas sweater, but as a general rule, Inkling only wears collars and harnesses. 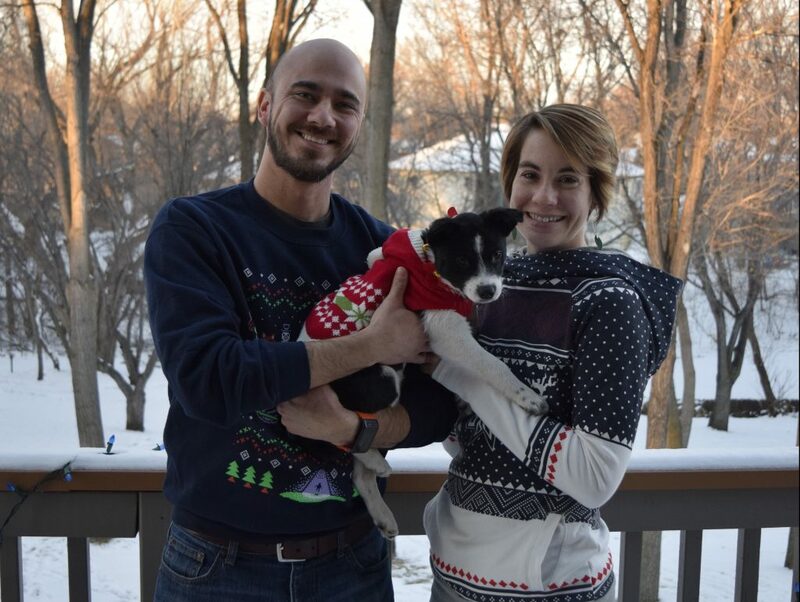 Full disclosure – Christmas sweater pictures are a real thing that happens. The other exception to this rule (you know, besides the aforementioned costumes) is the Stumptown Jacket from Ruffwear. Yes, I know dogs come with their own fur coat, and that’s just fine when it’s 20 degrees and we’re headed outside for a quick pee. 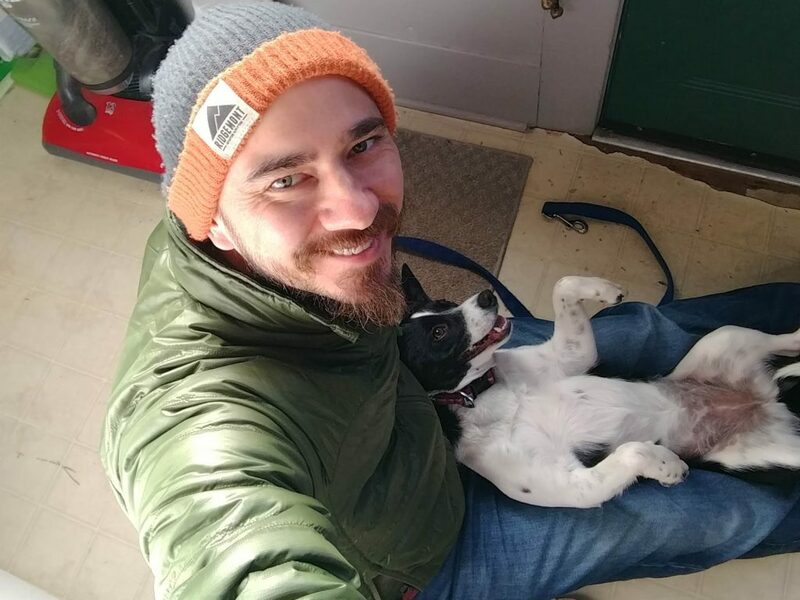 But when the temperature hits single digits – or lower – and we’re headed out for a hike, I want to ensure that she’s plenty warm. The Stumptown Jacket fits nicely, covers Inkling all the way down to her rump, and stands up to all the abuse she can throw at it. Which is a lot – she runs, falls, rolls over, and climbs on everything she can. Ruffwear makes this jacket from quilted polyester insulation with an abrasion-resistant exterior. 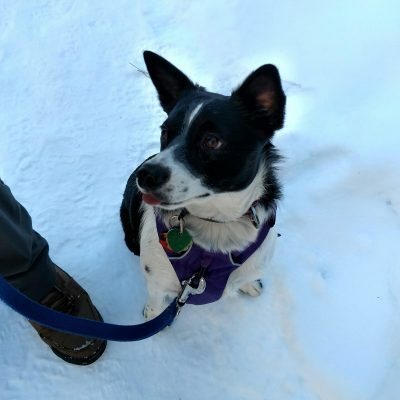 It has a leash portal that works with harnesses, which is super helpful when we’re on the trail since Inkling still has a lot to learn about hiking manners. It clips on easily, and unlike a lot of other coats we looked at, it covers a lot of her little body without drooping off of her. If you have a Husky, a Newfoundland, or other breed that has been bred for winter weather, they may have little need for a coat. For short-haired mutts like Inkling, however, it makes a world of difference. People will laugh and say that dogs have survived for millennia without coats, and that’s true. But I like to think about the difference between survival and comfort. A little different view so you can see how it comes down her chest, then buckles behind her front legs. Think of it like a sleeping bag. When you go winter camping, do you want a sleeping bag that will simply keep you alive through the night, or one that provides a comfortable night’s sleep? Can your dog survive a walk without the Stumptown Jacket? Probably. But I’d much rather my dog enjoy her walk in comfort. 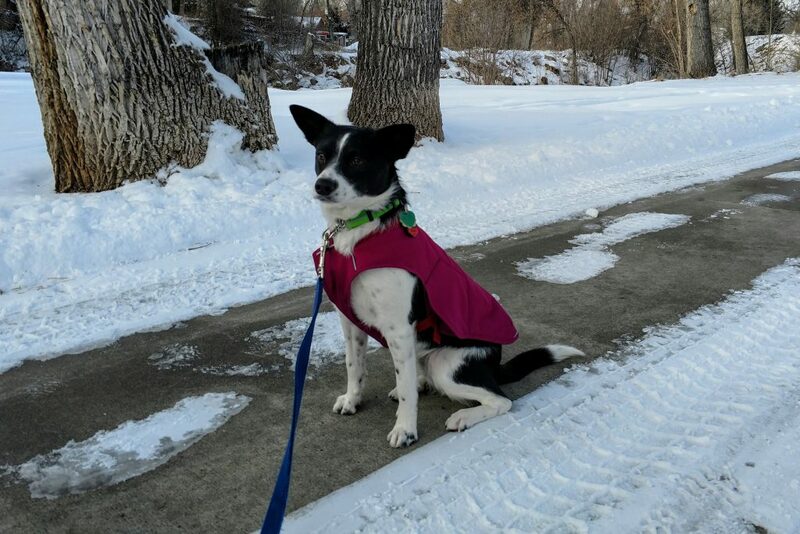 Ruffwear keeps Inkling from getting cold with the Stumptown Jacket. 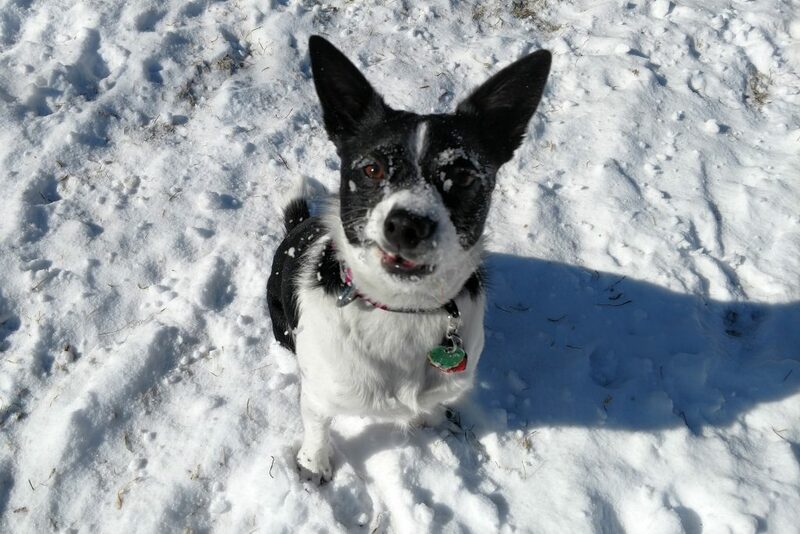 So what do we do about the snow and ice buildup on her paws and between her pads? Musher’s Secret makes a huge difference in Ink’s ability to walk in snow and ice. I love this Musher’s Secret because it works incredibly well! I put a light coating on Inkling’s pads once or twice a week just as a moisturizer and protectant. Her little pads soak it up in less than a minute, and we’ve had no issues with it coming off on couches, carpeting or clothing (if you do, then you’re using too much). Before I take her out in extreme cold, deep snow, or icy conditions, I give her a slightly more liberal application, and work it around and between the pads. Just about to put some Musher’s Secret on those paws! Before we started using Musher’s Secret, Inkling wouldn’t last long outside once temps dropped into the single digits, especially with snow and ice on the ground. Now she can handle a good long walk or an hour of ball in the back yard; I have to retreat to warmth before she does. 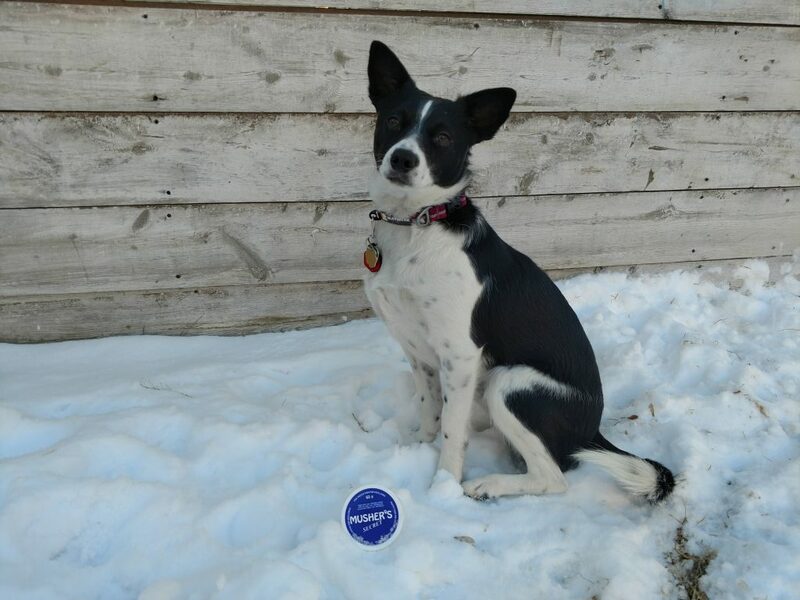 Inkling doing her best spokesmodel pose with her Musher’s Secret. 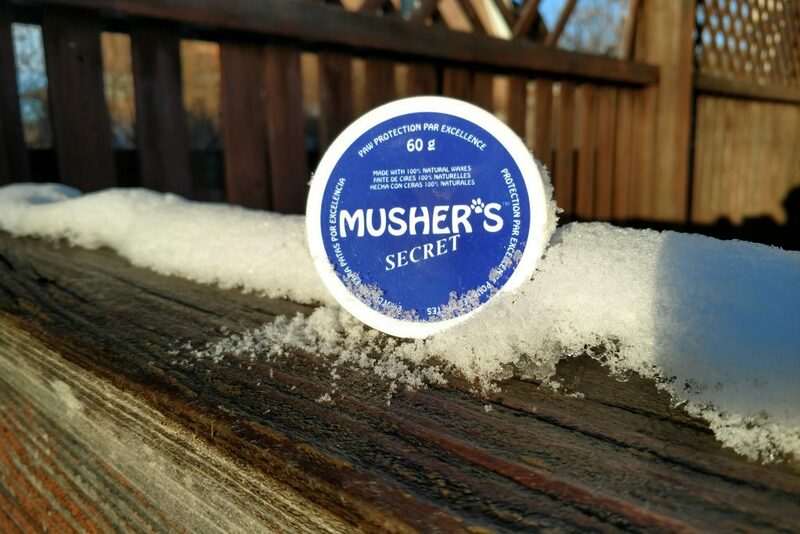 Musher’s Secret is all natural, made from food-grade waxes and oils with Vitamin E. It’s 100% non-toxic and – if you’re into this kind of thing – it’s non GMO and Gluten-free. Most importantly, it’s awesome at what it does. It protects Inkling’s paws out in the elements, while still allowing natural perspiration through the pads, as well as conditioning and moisturizing them. It even protects her trotters from salt and other ice-melters on the sidewalk, which means one less thing for me to worry about. These two things made Inkling into a winter dog! 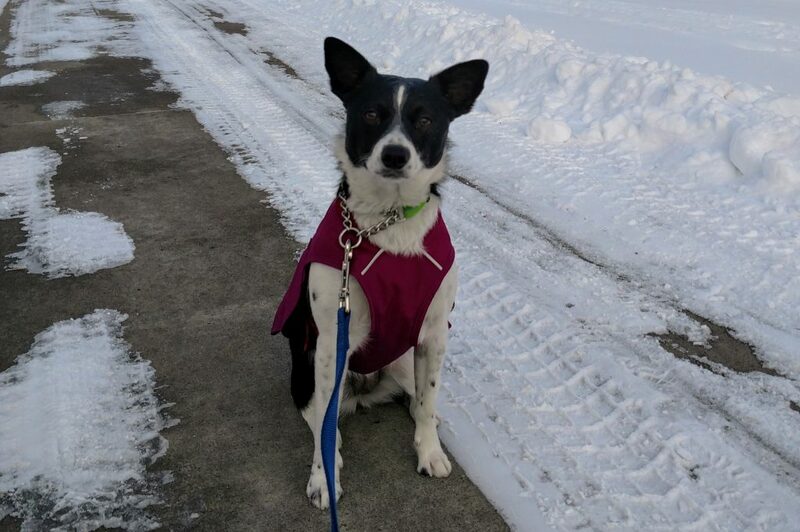 Seriously, the Stumptown Jacket and Musher’s Secret have provided significant improvements to how we manage the winter weather, and helped create positive changes to Inkling’s behavior during the winter months. They’re worth their weight in gold! So if your dog has gotten cranky or ill-mannered because they’ve been stuck inside, try these out. They’ve made a huge difference for us, transforming Inkling from little miss frosty paws into a snow stomping winter dog! She’s still weird though. That’s how we like her.